The Nike Men's SP-8 Tour Golf Shoes will keep your feet dry and comfortable, even in the worst conditions. 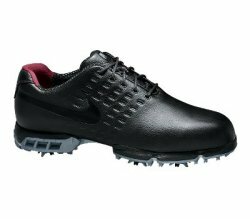 The Nike Men's SP-8 Tour Golf Shoes feature waterproof leather and the Q-Lok spike system. The T@C outsole proves Nike Golf's commitment to green-friendly performance traction. Maximum stability, enhanced flexibility and significantly reduced weight deliver the most technologically advanced outsole in golf. From Anonymous of Del Mar, California on 7/8/2007 . I have tried several brands of golf shoes and the Nike SP-8 TW are the most comfortable, best looking shoes I have worn. Great traction on the course. I liked the black pair so much, that I went out and bought the white pair too. 7/8/2007 – Do these shoes come in 8 1/2?